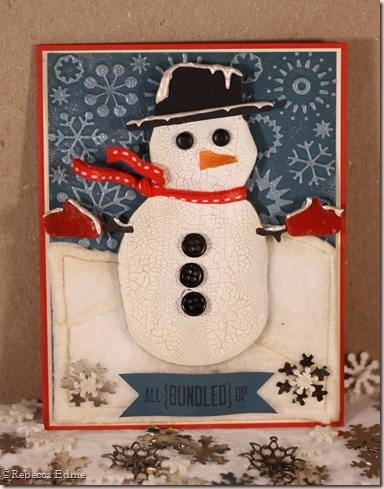 Even though most of the pieces in this Basic Grey chipboard pack were Christmasy, I just loved the snowman and two huge, intricate snowflakes so I bought it anyway. It was fun thinking up details to accent this card. This card is for Clear Dollar Stamps Challenge CIC3, Winter Theme. Isn’t he cute? The background is not quite navy, dry embossed with a Cuttlebug folder then heat embossed. I used white pearls over white pigment ink gently wiped across the raised areas and it looks very snowy and wet IRL. The hills are made from three layers of cotton quilt batting. Much more stable than the poly fill used for most quilts and comforters, this fill is used for true, old-fashioned quilts. I sewed it to the embossed layer with tan thread to go with my antiquey, vintagey look. The hills are distressed with Antique Linen. The snow man himself was painted with Crackle paint, distressed and the top half lifted up with foam dots. I used an idea from one of Tim Holtz’ 12 Days tags to make a scarf using wire sandwiched between two layers of ribbon. The mitts are felt, also distressed for a darker red look. The hat is plain cardstock; I tried colouring the felt with Copics for a black hat, HORRIBLE!! It just doesn’t soak into the lower layers well so it just looked like really dirty red felt! However, the Copic worked well for colouring the buttons. What I thought were tons of black buttons were actually dark grey! The twig arms were painted in with acrylic paint, the eyes are brads with the backs cut off and I used a scrap of torn cardstock antiqued with Linen for the carrot nose. Finally I added the liquid pearl ‘snow’, the layered snowflakes in the corners and the banner. Paper: real red, not quite navy, white, black, pumpkin CS-SU! This is so so cute. Great job!